President Elect, Chris Monger, jumped the gun on the Annual Retreat, to be held on the weekend of April 21-22 in conjunction with the District Conference in Coeur d’Alene. He asked each table to discuss three topics: 1) How to make the meetings shine for members and guests; 2) What can we do to continue to prosper and keep the members engaged and involved; and 3) Should we take on another major project? Martin Clavijo spoke of his family and life in his classification talk. Steve Roberts summarized our progress on the upcomping 10K. Have more pro/con debates as the weekly features. Have committee chair training courses. Get younger members involved with Rotary. Solicit more world class speakers. Bring in major local employers as guest speakers. Do a big community project (remember this has the potential to energize or divide the club). Provide coaches for younger members to help them along in their professional lives. More whimsical ideas included: substitute Zinfandel for the cranberry juice and build a home for retired BBRCers. With ideas like these, we are sure the Retreat will be a huge success! President Martinka called the meeting to order; Mark Hough provided the Invocation and Pledge of Allegiance. 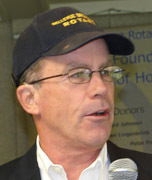 Tim Moriarty introduced one visiting Rotarian and no guests. Martin Clavijo in true Microsoft fashion provided a nice PowerPoint presentation with his talk. Martin is from Cartagena, Colombia, home to world class emeralds and coffee. He received a marking degree in his native country and was introduced early to Rotary as an exchange student with a family in Concord, NH and then as a Roteract member. He joined Microsoft in Ecuador and was soon promoted to a job in Ft. Lauderdale and then to HQ in Redmond in 2006. Martin and his wife initiated on their own two major community service projects in Colombia, a large (120 person) old persons’ home and the Facmes Foundation. When he moved to Redmond he started looking for a place that could satisfy his need to give back to the community and that is how he ended up at the BBRC. Martin is married and has two children and is already proving himself to be a real asset to the BBRC! Steve Roberts recounted how last year’s race nearly did not happen because of a lack of volunteers along the race course. Without volunteers there can be no race so please go to the BBRC website and register now to help the Committee. Remember this is the major fundraiser for the BBRC! It is too bad the people who really know how to run the country are so busy cutting hair and driving taxis.